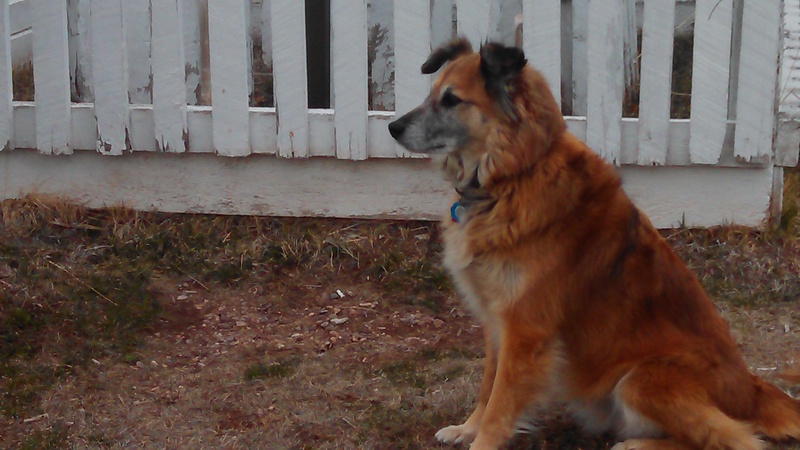 And east, to Denver and then on to the flat lands of the middle | Can I Bring the Dog? Even though I left later than I planned, I took State Route 49 the long way to Truckee, CA and I 80. It’s one of those roads on your map with the little green dots indicating a scenic by-way. Then I joined up with the big road, I 80, that would take me all the way to Oakland, CA, or to I 81 in Pennsylvania, where I could turn north to Kathy and Ben’s where this whole big circle started. And then I drove as log as I could, ending up in a motel in Elko, Nevada at about 10 PM. I wasn’t hungry, which is a shame, because by coincidence one of Jane and Michael Sterns Road Food finds shared the parking lot. Too bad I wasn’t in the mood for some late night Basque food, they say it’s terrific. And while we’re on the Sterns, I tried to go to the Navajo Hogan in Salt Lake City later the next day, but it was closed on Monday. Too bad, as it serves only Native American food and I’d like to try a taco that comes on frybread instead of a tortilla. Anyhow, we spent the night in Elko before we had a chance to miss the Navajo Hogan and find a shrimp burrito instead. Sunrise over Elko. That white strip at the center is Chico’s tail, glowing in the early light. 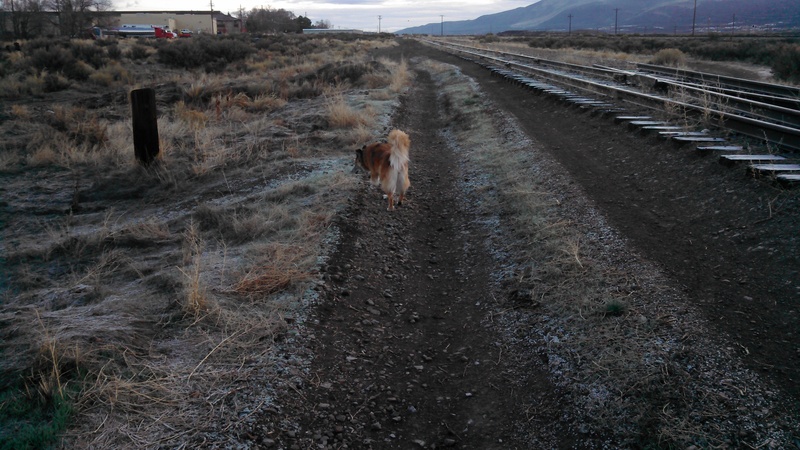 The railroad tracks are a great place to walk off-leash and they were right behind the motel. We drove across the rest of Nevada, and into Utah, then Wyoming, where all of a sudden my little car seemed very little, and a giant dually Chevy truck (like the ones that kept passing me even though I was doing the speed limit of 75) started to seem like it would make sense. 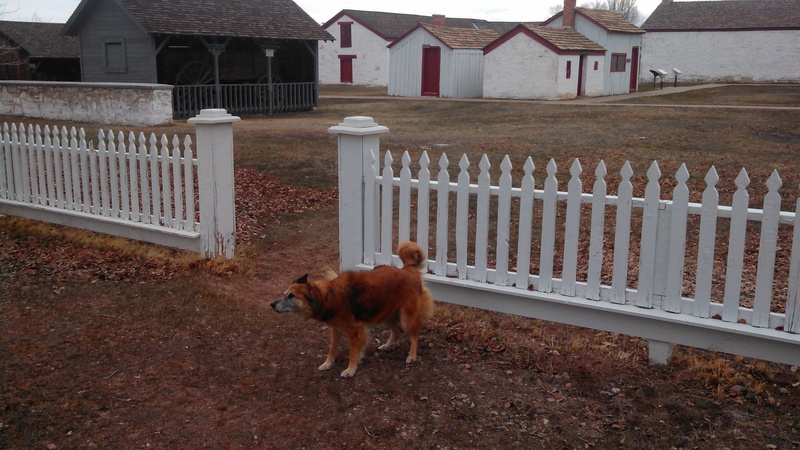 I saw a sign about Fort Bridger, WY and the grave of famous dog Thornburgh (who I’d never heard of, but it seemed appropriate to my dog-themed trip), so I pulled off to have a look. And Chico, seen mid-shake, was ready to get out of the car. 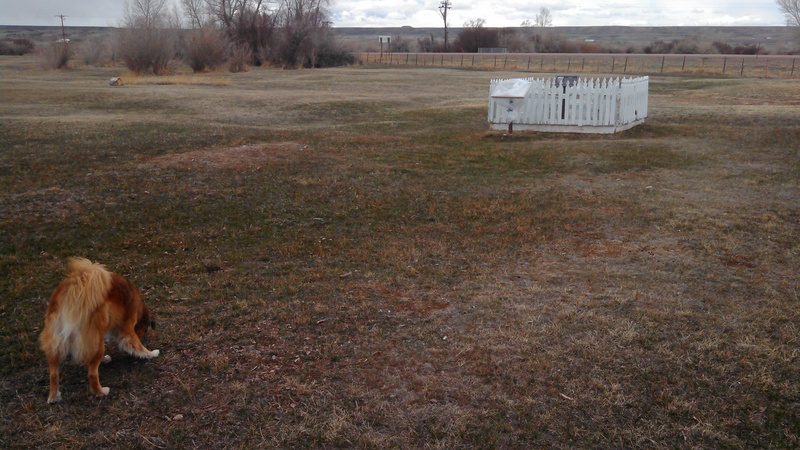 The grave and headstone are within a double layer of picket fence. And the secluded but open area was great for a dog to run in circles, jump in the creek, and generally burn off some energy. 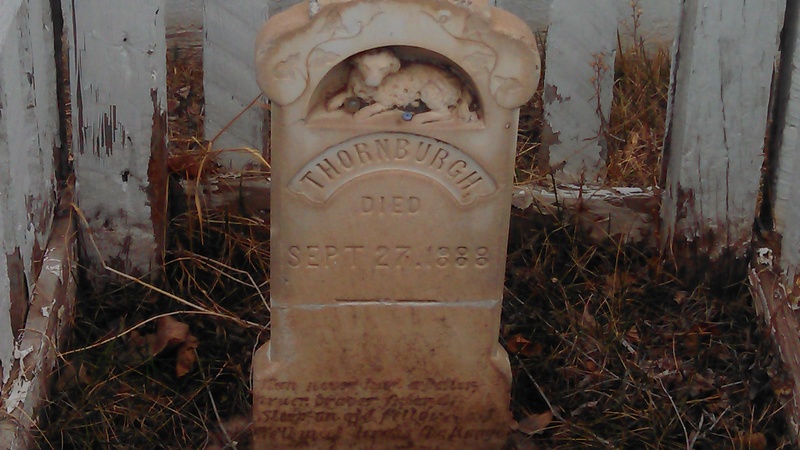 Named after an officer at the fort, Thornburgh was well loved by the soldiers. Super nice headstone, for any critter – two or four legged. If only I could say that Chico was suitably somber. I’m sure he sees something off in the distance and is evaluating it. We spent the night in Rock Springs, WY and the next day continued on to Denver and Golden to see some friends for a couple nights and a day, which allowed me to catch up on blog posts, eat good food, walk the dog in a beautiful place, eat Nepali momos for lunch in Boulder, meet a baby, and catch up on the latest and greatest news from old friends. Next we’re off on a small detour to Rochester, MN to get my friend Susan and head up to northern Minnesota, to Chisholm, the small town where my mother grew up. I’m hoping to be able to do the research to figure out where she lived, and where her father’s store, the People’s Department Store, was. 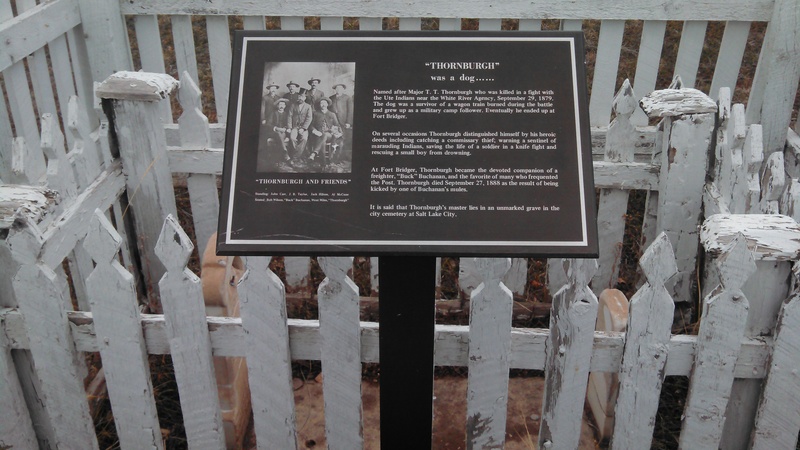 This entry was posted in Uncategorized and tagged chisholm mn, Field Trip, Fort Bridger, road food. Bookmark the permalink. 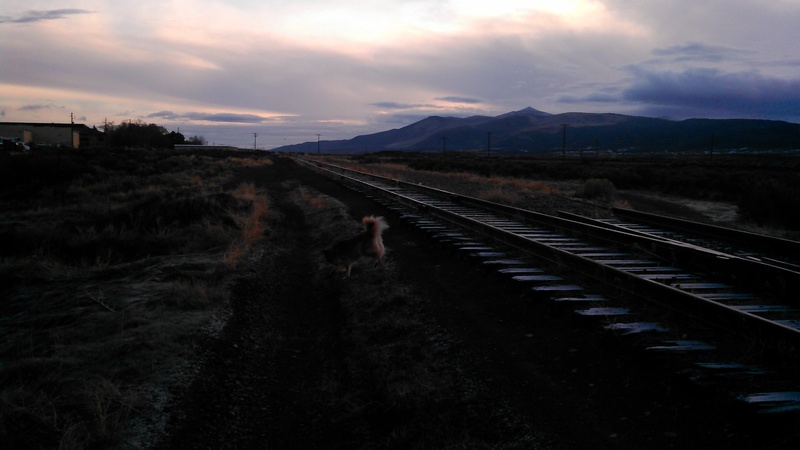 Gorgeous train tracks… and love the Thornburg memorial. What a name. So curious what on earth Nepali momos are and excited to hear about Chisholm! Momos are the Tibetan version of *gyoza. * If presented with the opportunity, do try them.